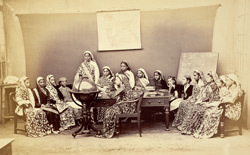 Photograph of a class in the Alexandra Native Girls' Institution at Bombay in Maharashtra from the Archaeological Survey of India Collections: India Office Series (Volume 46), taken by an unknown photographer in c.1873. This image, showing a class of pupils seated in a semi-circle around a globe was exhibited at the Vienna Exhibition of 1873, and is mentioned on page 224 of John Forbes Watson's catalogue of the Indian Department. Female education in India grew dramatically in the latter part of the nineteenth century. The Imperial Gazetteer of India states regarding female education, "The Government did not take up the subject until 1849, when Lord Dalhousie informed the Bengal Council of Education that henceforth its functions were to embrace female education, and the first girls' school recognized by Government was founded shortly afterwards by a committee of native gentlemen. The despatch of of 1854 directed that female education should receive the frank and cordial support of Government...The Education Commission of 1882 advised that female education should receive special encouragement and special liberality...The adoption of this attitude has resulted in a considerable development of the public instruction of girls, although it still lags far behind that of their brothers. In 1871 there were 134 secondary and 1,760 primary girls' schools; in 1901-2 the numbers were 461 and 5,628 respectively."